We are Guangzhou Da Sanjiang Machinery Co, Ltd., manufacturer of the Chinese instant noodle machine and instant noodle production line. We make the non-fried and fried instant noodle making machine, the Italian pasta machine, and the Asian vermicelli rice instant noodle machine that feeds on granular rice to make instant rice noodle vermicelli or starch vermicelli made from mung bean, corn, potato, sweet potato, yam, tapioca and other starch. Our instant noodle machines can produce glass noodles, Sotanghon, or Chinese Rice Noodles (bihon or bihun). We are doing turn-key projects everywhere on the earth. We even built 2 fresh instant noodle production lines with the output capacity of 6 tons per shift in the United Kingdom, the first industrialized nation in the world. Similar projects accomplished by our team include Pt Indofood Project, Output: 4T/shift; and Acecook Vietnam Co., Ltd. Project, Output: 4T/shift. Long before the time of the modern instant noodles made by the instant noodle making machine, there were similar pre-fried egg noodles in China called Yi mein or E-fu noodles. 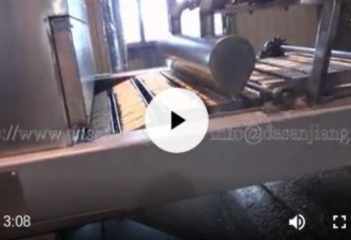 This Yi mein machine (E-fu noodle machine) makes the great delicacy in bulk quantity by a process similar to the ordinary instant noodle machines, except soda is added in the dough and shape of the noodles are different. And the diameter of the Yi Mein block is about the size of a regular pizza and the thickness is 2 to 3 inches. 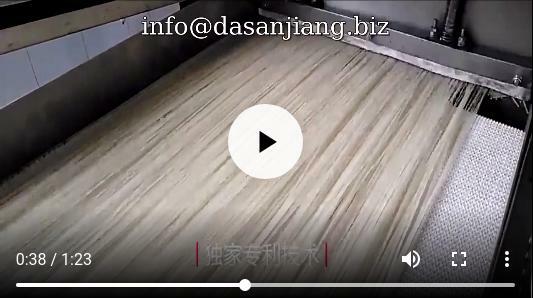 Our instant noodle machine turn-key projects use the most reliable machines made by Da Sanjiang and selected partners. The instant noodle making machine of high quality made by Da Sanjiang and selected partners guarantee the success of our turnkey projects. The complete set of fried instant noodle making machines are currently the main stream in the instant noodle industry. Fried instant noodles are usually served after soaking them in hot water for 3 minutes without cooking. Dried cooking instant noodles are less expensive to produce without the extra expense of the frying oil. The difference between the two types of complete sets of instant noodle machines are the dehydration methods, namely deep frying or hot air drying. 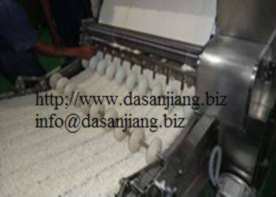 Rice vermicelli production lines always use hot-air drying process. We provide the complete set of non-fried and fried instant noodle equipment as well as the individual instant noodle machines for unit operation. Our product line includes wheat flour and rice noodle machines, that make instant noodles, instant ramen noodles, rice noodles, easy cooking instant noodles (Chinese Hakka noodles and Japanese ramen), banana fryer machines, and Chinese dumpling machines; fully automatic fried and non-fried instant noodle production lines, the easy cooking ramen instant noodle machines, pre-cooked and fresh raw instant ramen noodle making machines, and other instant noodle machinery and noodle equipment. Multi-Layer Instant Noodle Machine Steamer - Optionally you may select the single layer steamer if your have a lot of space. The steamer is a required machine for fried and non-fried instant noodle making plant and dried cooking instant noodle plants. This starch instant noodle production line is characterized by sheet forming, cooking, and shredding, a very good alternative to the process of extrusion of pre-cooked starch or rice dough through a die. Cellophane noodles are also known as glass noodles. Cellophane noodles are transparent while rice noodles are white. They are different. However, they are made with a similar instant noodle machines. Therefore, the instant noodle production line designed for making cellophane noodles can also be used to make rice noodles with rice milling and processing machines added to the line. They are silky food made from mung bean, sweet potato starch, etc. They are often called dong fun or tang hun (winter vermicelli, mainly in Taiwan). In Japan, cellophane noodles are called harusame (spring rain). The Korean call them dangmyeon (Tang noodle). In Vietnam is called bún tàu, miến or miến dong (made from canna starch). The best cellophane noodles are made from mung beans. Cornstarch or sweet potato starch and also be used to make cellophane noodles. But the quality is not as good as mung bean cellophane noodles. Because the amylose in mung beans is the most abundant so that the noodles are not easy to become mussy after cooked, and the texture is the most slippery. This a fully automatic long pasta cutting machine suitable for the starch and rice vermicelli production line, starch vermicelli, cellophane glass noodle production line. 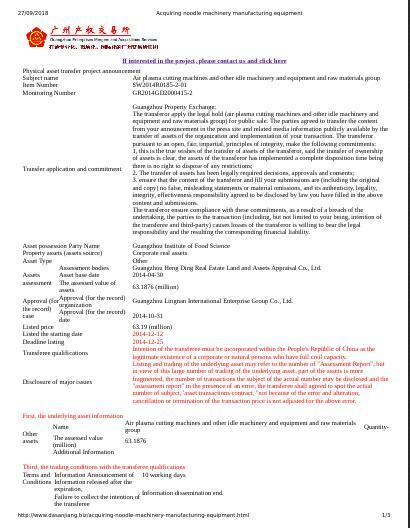 Our company has acquired all the assets of Guangzhou Institute of Food Science (formerly known as Guangzhou Grain Machinery Factory,transaction ID SW2014R0185-2-01 via Guangzhou City Property Exchange). We also recruited their engineers, managers, senior technicians and so on. This 30 years old enterprise, the only state-owned manufacturer instant noodle making machines in Guangdong Province, has ended their business in food machinery manufacturing and its human resources and the instant production line equipment have merged into our company - we are growing more and more powerful. We also make the sweet potato fryer that produces snack chips. This is different from ordinary fryers in that it saves energy and it is very easy to operate. We can provide the individual machines as well as processing lines including the packaging system.